The last Bulletin report (BGVN 35:11) detailed an explosive eruption that began with gas-and-ash explosions in September 2010 and ended in mid-October 2010. Renewed activity began in February 2011 and continued through June 2011. In this report, we highlight the significant ash events from early-to-mid 2011 as well as the continuous monitoring efforts of Servicio Nacional de Geología y Minería (SERNAGEOMIN) during 2011-2013. During 17 February-27 June 2011, unrest was detected from Planchón-Peteroa and significant meteorological information (SIGMET) notices were distributed by the Buenos Aires Volcanic Ash Advisory Center (VAAC) (table 3). Ash plumes were reported once or twice a month during this time period, although satellite images were not able to detect many of the events. Ash and gas plumes became continuous during late April, and ash plumes rose as high as 5.8 km above sea level(on 26 April). On 29 April, SERNAGEOMIN raised the Alert Level to 3 (Yellow). Table 3.Emissions from Planchón-Peteroa during 18 February-27 June 2011. The Observatorio Volcanológico de los Andes del Sur (OVDAS) maintained a web-camera that contributed to numerous direct observations of emissions and is frequently listed as a source. Courtesy of VAAC. 18 Feb 2011 3-4.3 km SE SIGMET No ash visible in satellite images. 18 Mar 2011 3-4.3 km SE SIGMET; ODVAS Steam-and-gas plume visible from ODVAS web-camera. No ash visible in satellite images. 26 Mar 2011 -- -- SIGMET No ash visible in satellite images. 1-16 Apr 2011 -- -- SERNAGEOMIN White vapor plumes visible from the web-camera based in Romeral. 17 Apr 2011 4.6 NE SIGMET No ash visible in satellite images. 18 Apr 2011 4.6 NE SIGMET No ash visible in satellite images. 26 Apr 2011 5.8 E SIGMET No ash visible in satellite images. 16-19, 21, 25-29 Apr 2011 1.2-6.4 SW and NW SIGMET; SERNAGEOMIN Frequent ash plumes. Web-camera images captured plumes containing ash- to lapilli-sized particles during 17-19 and 29 Apr. 30 Apr 2011 1.2-6.4 NW and N SIGMET; SERNAGEOMIN No ash visible in satellite images. 1 May 2011 4-6.1 NW SIGMET No ash visible in satellite images. 2-3 May 2011 4.6-5.5 NE and E SIGMET; ODVAS Ash-and-gas plumes. 4-5 May 2011 4.3-7.3 NW and ENE SERNAGEOMIN; ODVAS Overflight by SERNAGEOMIN on 4 May. No ash visible in satellite images. Ashfall was reported by proximal towns (see text). 6 May 2011 4.6-5.5 SE GOES A thin plume of ash, steam, and gas. 7-10 May 2011 4.3-5.5 SE SERNAGEOMIN; ODVAS Gas-and-ash plumes visible from ODVAS web-camera. No ash visible in satellite images. 24-25 Jun 2011 4.6 W, NE, and E SIGMET No ash visible in satellite images. 27 Jun 2011 na NW Buenos Aires VAAC Gas-and-steam plumes possibly containing ash. Seismicity in April 2011 was dominated by volcano-tectonic (VT) events; 405 were detected, and locations were primarily concentrated in an area 25 km NE of the volcanic complex as well as along the N flank, ~6 km from the crater. Earthquakes were MC 2) and 30 long-period (LP) (RD 4 cm2) events were also detected that month. SERNAGEOMIN frequently reported seismic data in terms of RD, which is the value calculated from reduced displacements. SERNAGEOMIN reported that ash emissions on 17, 18, and 29 April correlated with episodes of tremor with RD oscillating between 1 and 3 cm2. Overflights conducted on 26, 27, and 29 April determined that the active crater had not changed geometry and also appeared structurally stable (figure 7). The observers noted that tephra deposits from the previous explosions were notable SE and SW of the volcano. Deposits from the 29 April explosion were particularly easy to define during the overflight. Figure 7. This photo of Planchón-Peteroa was taken during one of a series of overflights during 26, 27, and 29 April 2011. A column of ash rose from the active crater and tephra had visibly covered much of the snow immediately SE and SW of the crater. Courtesy of Orlando Rivera, Exploraciones Mineras Andinas S.A.
Buenos Aires VAAC reported a significant ash plume detected by satellite images on 2 May 2011. The plume drifted between 4.9 and 5.5 km above sea level. toward the NE at ~7.7 meters/second. The OVDAS web-camera also captured images of the plume appearing diffuse and ~3.7 km wide. The VAAC noted that the plume rapidly dissipated during 1315-1845 local time. The following day, continuous emissions of ash, steam, and gas were reported by SIGMET and the VAAC, although satellite images were not able to detect any emissions. By 1000, the VAAC reported SIGMET data for a plume that rose 4.6-5.5 km above sea level, moving E. At 1500, satellite images captured a diffuse and ~15 km wide ash plume. The plume drifted E at 5 meters/second and had risen 5.5 km above sea level. Figure 8. During an overflight of Planchón-Peteroa on 13 June 2011, few bare rocks were visible around the active crater due to snow-cover and ice; a low-level plume of white vapor rose from the crater. These six photos are stillshots taken from a video interview camera; note that the look direction varies in each photo with the approximate direction noted in the upper-left-hand corner of each photo. The tall peak of Planchón is visible in the background of the photo looking N. Courtesy of SERNAGEOMIN and RedMaule. The Buenos Aires VAAC released an ash advisory on 29 October 2011. Satellite images could not detect ash, but a SIGMET was available. No other reports were issued by the VAAC through the end of this reporting period (December 2013). Seismicity during 2012-2013. Monthly reports from SERNAGEOMIN highlighted seismicity and visual observations from a network of local web-cameras. Each report also included links for additional information from OMI (http://so2.gsfc.nasa.gov/pix/daily/0314/cchile_0314z.html) and MODVOLC (http://modis.higp.hawaii.edu/). Activity during 2012. An approximate average of 400 earthquakes per month was detected in 2012, and roughly 75% of the events were VT while 25% were cataloged as LP events. The VT events were rarely larger than ML 3.0 and depths were in range of 4-10 km; these earthquakes were frequently clustered in groups that correlated with local faults. LP earthquakes were typically MD ≤2.0 and RD ≤2.9 cm2. SERNAGEOMIN reported tremor in April, May, November, and December (table 4). One notable seismic swarm occurred on 5 April. Approximately 123 VT earthquakes were detected during 0230-0730; these events were located ~20 km NE of the crater with depthsL1.7. Table 4. Tremor was detected during four months in 2012. RD is the value calculated from the reduced displacements of seismicity. Courtesy of SERNAGEOMIN. On 30 October 2012, the Oficina Nacional de Emergencia del Ministerio del Interior y Seguridad Pública (OMENI) released a report highlighting several communities that would be included in the early warning system designed to report flood risks. The towns included Curicó, Romeral, and Teno, in the region Maule, which are especially vulnerable due to proximity to Planchón-Peteroa's major drainages (figure 9). Figure 9. This Google Earth image includes the location of Planchón-Peteroa (lower right-hand corner), major towns, and primary roads. The background image is a composite of Landsat images from 2014. Note that the yellow line crossing through the volcanic center is the international border for Chile and Argentina. The scale is approximate. Courtesy of Google Earth. On 6 November 2012, the network of web-cameras captured images of a white plume rising from the crater. At 1620, the persistent plume rose to ~1.3 km and drifted NE. SERNAGEOMIN noted that this activity was related to fumarolic emissions. Activity during 2013. During 2013, an approximate average of 200 earthquakes was detected per month. Of these events, ~80% were VT and ~20% were LP. Magnitudes and depths of the VT earthquakes were comparable to the previous year, although ML values were sparsely reported. LP seismicity was reported in ML, instead of MD and values were in range of 0.3 to 2.0. The reduced displacements (RD) of LP events were frequently reported on a monthly basis with values in range 0.3-8.4. Tremor was rarely detected in 2013. SERNAGEOMIN reported six episodes of tremor, but these only occurred in January and the calculated RD was 0.5 cm2. Information Contacts: Observatorio Volcanológico de los Andes del Sur-Servicio Nacional de Geologia y Mineria (OVDAS-SERNAGEOMIN), Avda Sta María No. 0104, Santiago, Chile (URL: http://www.sernageomin.cl/); Buenos Aires Volcanic Ash Advisory Center (VAAC) (URL: http://www.smn.gov.ar/vaac/buenosaires/productos.php); and Oficina Nacional de Emergencia del Ministerio del Interior y Seguridad Pública (OMENI) (URL: http://www.onemi.cl/index.html). Observatorio Volcanológico de los Andes del Sur (OVDAS)-SERNAGEOMIN and ONEMI reported increased activity at Planchón-Peteroa beginning in the morning of 16 December. Low-intensity pulses of tremor were detected by the seismic network and associated with pulsating grayish gas emissions which rose no higher than 800 m above the vent rim. Webcams recorded crater incandescence during the night of 15-16 December. The Alert Level remained at Yellow (the middle level on a three-color scale) for the volcano, and ONEMI maintained Alert Level Yellow for the communities of Molina (66 WNW), Curicó (68 km NW), Romeral (75 km NW), and Teno (68 km NW). Based on Observatorio Volcanológico de los Andes del Sur (OVDAS) - SERNAGEOMIN observations, ONEMI reported on 17 May that the number and magnitude of earthqaukes at Planchón-Peteroa had gradually declined during the past months, reaching baseline levels. Minor to no surface activity was noted. OVDAS-SERNAGEOMIN lowered the Alert Level to Green (the lowest level on a three-color scale), and ONEMI canceled the Yellow Alert for the communities of Molina (66 WNW), Curicó (68 km NW), Romeral (75 km NW), and Teno (68 km NW) that had been in place since 1 July 2016. Based on Observatorio Volcanológico de los Andes del Sur (OVDAS) observations, SERNAGEOMIN reported an increase in the number of long-period earthquakes at Planchón-Peteroa beginning on 15 January. On 22 January the Alert Level was raised to Yellow. Based on SIGMET notices, the Buenos Aires VAAC reported that during 24-25 June ash plumes from Planchón-Peteroa rose to an altitude of 4.6 km (15,000 ft) a.s.l. and drifted W, NE, and E. On 27 June satellite imagery showed a gas-and-steam plume, possibly containing ash, drifting 110 km NW. SERNAGEOMIN reported that, based on video camera data, photographs, and observations during an overflight on 4 May, activity at Planchón-Peteroa was relatively stable during 30 April-8 May. Explosions lasting about 30 seconds produced ash plumes that rose at most 1 km above the crater and drifted tens of kilometers E, NE, NNE, NNW and NW. During 4-5 May material fell in Minera Río Teno (about 70 km NW) and Las Leñas, Argentina (45 km ENE). The Alert Level remained at Level 3, Yellow. Based on ODVAS web camera observations, the Buenos Aires VAAC reported that on 9 May gas-and-ash plumes rose to an altitude of 4.3 km (14,000 ft) a.s.l. and rapidly dissipated to the SE. SERNAGEOMIN reported that during 1-15 April a camera installed in Romeral, approximately 61 km NW of Planchón-Peteroa, recorded predominantly white vapor plumes that rose at most 600 m. During 16-19, 21 and 25-29 April episodes of ash-plume production changed from discreet plumes to more continuous emissions. Ash plumes during 17-19 and 29 April rose 1.2 km and contained ash- to lapilli-sized particles. During overflights on 26, 27, and 29 April, a geologist noted that the crater geometry and fumarolic activity had changed very little during the previous few months and that ash emissions drifted mainly SW. SERNAGEOMIN stated that because ash-and-gas emissions were becoming almost continuous, the Alert Level was raised to Level 3, Yellow on 29 April. Based on analyses of satellite imagery, SIGMET notices, and ODVAS web camera observations, the Buenos Aires VAAC reported that during 2-3 May gas-and-ash plumes rose to altitudes of 4.6-5.5 km (15,000-18,000 ft) a.s.l. and drifted NE and E.
Based on a SIGMET notice, the Buenos Aires VAAC reported that on 26 April an ash plume from Planchón-Peteroa rose to an altitude of 5.8 km (19,000 ft) a.s.l. and drifted E.
Based on a SIGMET notice, the Buenos Aires VAAC reported that on 17 April an ash plume from Planchón-Peteroa rose to an altitude of 4.6 km (15,000 ft) a.s.l. and drifted NE. Ash was not observed in satellite imagery. Based on a SIGMET notice, the Buenos Aires VAAC reported ash from an eruption of Planchón-Peteroa on 26 March. Ash was not observed in satellite imagery. Based on SIGMET notices, the Buenos Aires VAAC reported that during 17-18 March ash plumes from Planchón-Peteroa rose to altitudes of 3-4.3 km (10,000-14,000 ft) a.s.l. and drifted SE. On 18 March a diffuse steam-and-gas plume was visible in the ODVAS web camera. Based on SIGMET notices, the Buenos Aires VAAC reported that on 17 February an ash plume from Planchón-Peteroa rose to altitudes of 3-4.3 km (10,000-14,000 ft) a.s.l. and drifted SE. On 11 November, SERNAGEOMIN reported that seismicity from Planchón-Peteroa remained low. Observations from multiple sources, including a web camera and satellite images, showed that the height of the gas plume was lower than the previously reported height of 200 m, observed during 15-25 October. The Alert Level was lowered to 2, Green. SERNAGEOMIN reported that during 15-25 October seismic activity from Planchón-Peteroa was low. Observations based on images from a camera installed in the town of Romeral (approximately 60 km NW) and photos sent by staff from a mining company (65 km WNW) showed that plume color changed from gray to white on 13 October. The plume was smaller, with heights of less than 200 m above the crater. Satellite imagery analyses corroborated the ground-based observations. On 27 October, the Alert Level was lowered to 3, Yellow. Based on SIGMET notices, the Buenos Aires VAAC reported that on 12 October an ash plume from Planchón-Peteroa drifted E at an altitude of 4.6 km (15,000 ft) a.s.l. SERNAGEOMIN reported that during an overflight of Planchón-Peteroa on 30 September scientists observed an ash plume that rose 400 m and drifted E, diffusing over a wide area of Argentina. Parts of the ash plume drifted E and then NE, traveling tens of kilometers with an altitude as high as 6 km (19,700 ft) a.s.l. Also, a diffuse plume drifted S and SE at an altitude of 3 km (10,000 ft) a.s.l. On 1 October an ash plume drifted N and NW as far as Los Queñes, 30 km NW. A sulfur odor was also reported in Los Queñes. Based on analyses of satellite imagery, pilot observations, and SIGMET notices, the Buenos Aires VAAC reported that during 6-12 October ash plumes from Planchón-Peteroa rose to altitudes of 3-6.1 km (10,000-20,000 ft) a.s.l. and drifted in multiple directions. The Alert Level remained at 4, Yellow. Based on analyses of satellite imagery, pilot observations, and SIGMET notices, the Buenos Aires VAAC reported that during 30 September-3 October ash plumes from Planchón-Peteroa rose to altitudes of 3-6.1 km (10,000-20,000 ft) a.s.l. and drifted NW, NNE, E, and SE. Based on analyses of satellite imagery, the Buenos Aires VAAC reported that on 26 September an ash plume from Planchón-Peteroa rose to an altitude of 4.3 km (14,000 ft) a.s.l. and drifted SSE. According to NASA's Earth Observatory, a satellite image of Planchón-Peteroa shows an ash plume drifting 22 km SE on 18 September and ashfall on the snow beneath the plume. The Buenos Aires VAAC reported that according to a SIGMET issued on 21 September an ash plume rose to an altitude of 6.1 km (20,000 ft) a.s.l and drifted SE. Ash was not identified in satellite imagery. The Alert Level remained at 4, Yellow. SERNAGEOMIN reported that an overflight of Planchón-Peteroa on 7 September revealed that the explosions the day before were possibly phreato-magmatic in origin and similar to the explosions in 1991. Pulses of gas and ash had occurred every 40-60 seconds during the eruption. Plumes rose 200 m above the crater and ash mostly fell within 10 km to the E. During 10-13 September, plumes rising from the vent had progressively less ash and higher concentrations of water vapor. On 13 September, SERNAGEOMIN reported that petrographic and mineralogical studies of the ash indicated no juvenile components. The Alert Level remained at 4, Yellow. SERNAGEOMIN reported that on 6 September an explosive eruption from Planchón-Peteroa produced an ash plume that rose 1.2 km above the complex and drifted mainly E to a distance of 30 km, with some parts of the plume going N and S. That same day SERNAGEOMIN received pictures from Romeral (approximately 61 km NW) that showed ash-and-gas plumes rising 200 m.
Based on a pilot observation, the Buenos Aires VAAC reported that on 28 July a gas plume from Planchón-Peteroa drifted E.
Based on pilot reports and photographs SERNAGEOMIN reported on 13 January that fumarolic plumes from Planchón-Peteroa rose 250 m high on 4, 6, and 7 January. Increased fumarolic activity is common on the warmest days in the summer when snow melts in the crater and more steam is produced. On 14 May, ONEMI reported that increased fumarolic activity at Planchón-Peteroa was normal and likely caused by atmospheric changes that made the plumes more visible from greater distances. Increased fumarolic activity is common when snow melts in the crater and more steam is produced. The Buenos Aires VAAC reported that based on SIGMETs, increased fumarolic activity occurred at Planchón-Peteroa and Cerro Azul beginning on 26 January. Servicio Nacional de Geología y Minería clarified that intense fumarolic activity only occurred at Planchón-Petero around 25 January. Increased fumarolic activity is normal during the summer when snow melts in the crater and more steam is produced. On 31 January from 0700 to 1000 a well-defined vertical fumarolic plume rising from the summit area was visible from a highway 70 km W (Route 5 south). The white plume was ~ 50 m wide and 300 m high. Humidity was high, air temperature was low and there was no wind. On 16 February geologist Don Tormey visited the summit and observed a new fumarole field of 40-50 vents that are ~20 cm in diameter, covering a 100 m2 area. New hydrothermal salt deposits covered the field and strongly acidic gases were emitted with water vapor. The site of the fumaroles was near the cone that extruded the 1937 lava flow. Information Contacts: H. Moreno, Univ de Chile, Santiago, Chile; D. Tormey, Massachusetts Institute of Technology, USA. At 0140 on 9 February, a tephra eruption began at Planchón-Peteroa, a large basaltic to dacitic volcanic complex on the Chile-Argentina border roughly 200 km S of Santiago (figure 1). The eruption was continuing at press time (15 February), with no notable changes in eruptive style. No lava emission has been observed; the most recent lava flow, a mafic andesite, was erupted in February 1937. Figure 1. Map showing the location of Planchón-Peteroa. Courtesy of M. Gardeweg. Police in Carrizales (25 km NW) reported weak felt seismicity, followed by an explosion and the ejection of a brown column of gas and ash. No further seismicity was felt but there were no seismographs in the area. The eruption column averaged 400-700 m high and seldom exceeded 1,000 m. It was mainly formed by abundant pulses of vapor, with smaller, dense pulses of ash occurring every 10-15 minutes. The latter were audible 600-700 m from the crater. A weak sulfur odor was reported. Oscar González-Ferrán described the activity during his 11 February overflight as a low-level phreatomagmatic eruption. The plume traveled ENE into Argentina, at an altitude of roughly 5,000-6,000 m. NOAA weather satellite images on 11 February showed the plume extending 80 km E and ~ 30 km N-S. A change in wind direction on 13 February caused ashfall as far as 70 km W of the crater, alarming area residents. Large numbers of fish were killed in the Claro and Teno rivers, and the water supply for Los Queñes (population ~1,200), 35 km NW of the volcano, was contaminated. Contamination of the Río Claro may have occurred during the initial phase of the eruption, as water ejected from the crater lake, mixed with ice and tephra, entered the river (figure 2). Analyses of water taken from the Teno and Claro on 9 February showed notable increases in Fe and Mn contents, increases in turbidity, and a lowering of pH (table 1). Decreased contamination levels were noted 2 days after the start of the eruption. Potable water continued to be shipped to Los Queñes by special trucks. Ash now covers the small ice fields surrounding the active crater, and mixing of ash and melt from these fields may have caused additional contamination. 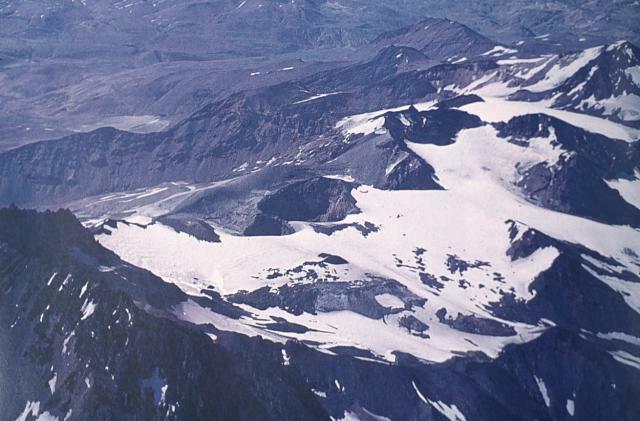 Possible increases in eruptive activity and increased snowmelt caused by the ash cover present potential lahar hazards. Figure 2. Sketch showing Planchón-Peteroa drainage, route of water contamination, and plume orientation, 11 February 1991. Courtesy of O. González-Ferrán. Table 1. Analyses of Los Queñes water from the Claro and Teno rivers by Empresa de Servicios Sanitarios del Maule S.A., NW slope of Planchón-Peteroa, February 1991. Standard column is the Chilean standard set by the Instituto Nacional de Normalizacion. Courtesy of M. Gardeweg. The eruption crater (200 m in diameter, within a 500-m-diameter crater), is in a depression between the cones of Planchón and Peteroa (figures 3 and 4). 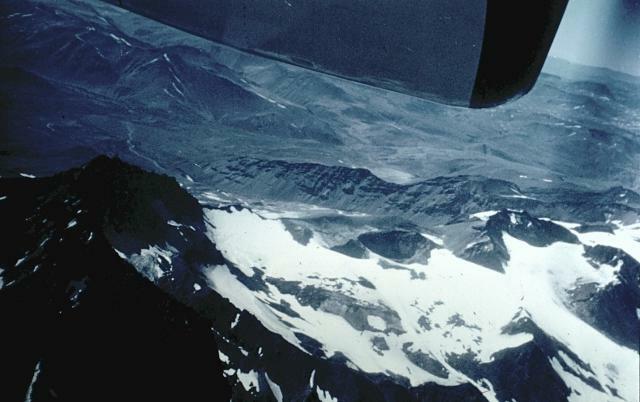 The larger crater has a rim elevation of 3,490 m and was the site of explosive activity during 1959, 1960, and 1967. On 25 March 1985, the inner crater was partially filled by a sulfurous lake (150 m in diameter), but no other activity was observed. A new fumarole field (100 m2 in area) was noted 16 February 1987 near the source of the 1937 lava (Moreno and Tormey, 1987, and 12:3). Lavas as old as 0.55 million years are found in the complex, which also includes products from Azufre volcano . . . to the SE (Tormey and others, 1989). The structure of the edifice is complicated by at least two syn-volcanic glaciations and a large debris avalanche (the "Teno Lahar") that removed a sector of Planchón. Figure 3. Sketch maps of the summit of Planchón-Peteroa based on 8 January 1955 (left) and 11 February 1991 (right) aerial photos. Courtesy of M. Gardeweg. Figure 4. Sketch map showing the summit region and craters of Planchón-Peteroa, February 1991. Courtesy of O. González-Ferrán. References. Moreno R., H. and Tormey, D., 1987, New fumarolic activity at Peteroa volcano: EOS, v. 68, p. 500. Tormey, D., Frey, F., and López-Escobar, L., 1989, Geologic history of the active Azufre - Planchón-Peteroa Volcanic Center (35°15'S, southern Andes) with implications for the development of compositional gaps: Asoc. Geol. Arg. Rev. XLIV (1-4), p. 420-430. Information Contacts: Moyra Gardeweg, SERNAGEOMIN, Santiago; Oscar González-Ferrán, Univ de Chile; SAB. Information from the city of Romeral's Emergency Office indicated that Planchón-Peteroa emitted noteworthy amounts of SO2 in October 1998 and showed signs of unrest in November 1998. Apparently, small phreatic eruptions produced minor explosions. Ash fell on Carrizales, ~8 km NW of the volcano, on 18 and 21 November, and fumaroles were observed from Carrizales on 24 November along with an intense SO2 odor. A local herdsman observed fine ashfall and intense fumaroles on 18 November and reported that fumes continued up to 24 November when he came down from the volcano. No seismic activity was felt. On 30 November, observers at ~3,050 m elevation on the E flank saw no fresh ash. The volcano last erupted in February 1991 producing a 500-1,000 m column of gas and dispersing fine ash as far as 30 km ESE of the volcano. Information Contacts: José Antonio Naranjo, Programa Riesgo Volcánico Servicio Nacional de Geología y Minería, (SERNAGEOMIN), Av. Santa María 0104, Casilla 10465, Santiago, Chile. Increased fumarolic activity was reported at Planchón-Peteroa (figure 5) during January and February 2001. There have been no reports of anomalous activity at the volcano since November 1998 when small phreatic eruptions produced explosions that deposited ash up to ~8 km NW of the volcano (BGVN 24:03). Figure 5. Map showing the location of Planchón-Peteroa (originally in BGVN 16:01). Courtesy of M. Gardeweg, SERNAGEOMIN. The first report of possible renewed volcanic activity was made on 12 December 2000 when observers on a commercial flight traveling S past Planchón-Peteroa saw steam rising from a fumarole to heights of 150-200 m and extending ~1 km SSE. The activity was considered normal for the time of year. Patricia Sruoga of the Servico Geológico Argentino reported that during late January to early February the altitude of steam emitted from fumaroles on Planchón-Peteroa was higher than was observed in 1996 and during trips to the volcano on 3 February and 3 March 1999. She also reported that there was an increase in the frequency of steam emission. The observations were made from Gendarmerie, 6 km E of the volcano. On 6 February observations made from a commercial flight heading S of the volcano revealed that steam from a fumarole rose to a height of ~150 m and extended a little more than 0.5 km toward the E. On 12 February another sighting of steam was made from a commercial aircraft in the area of Curicó (figure 5). Based on the general location, the steam was determined to have originated from one of Planchón-Peteroa's fumaroles. Information provided by José Piña from the Emergencia de la Municipalidad de Romeral confirmed that during the first couple of weeks of February there was indeed an increase in fumarolic activity. According to an observer in the area, since December 2000 there had been an increase in steam-and-gas emissions from the volcano along with a strong sulphur odor that was especially strong during the night. Piña visited the E flank of the zone of craters and discovered that there was a reddish material on the snow. He determined that the material was deposited through aeolian action, which is common due to strong winds in the area. He also noted that there was intense fumarolic activity at the NE crater, with fumarolic plumes rising up to 300 m above the volcano's W flank. 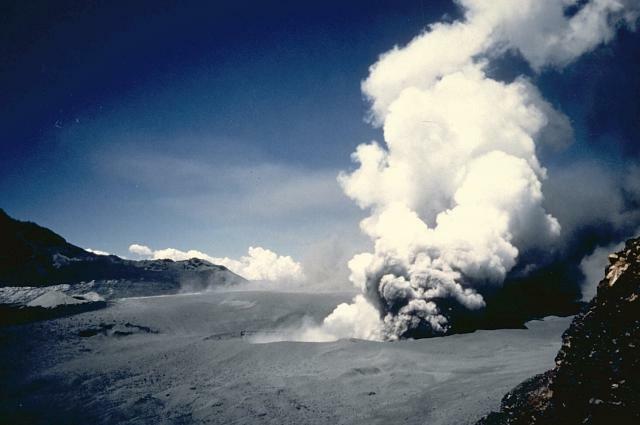 In addition, steam rose up to 100 m high as it escaped from the 1991-92 crater on the E flank. Occasionally there was a strong odor of sulfur and underground noises. Piña also noticed fumaroles on the top of Morro Planchón, whose plumes rose ~3.9 km high. These types of fumaroles were thought to be fed by melted snow that drips through fractures. On 16 February observations from a commercial aircraft traveling towards the N revealed that 500-m-high white fumarolic emissions extended ~1 km towards the SE. GOES imagery of the area in January and February did not show thermal anomalies aside from the normal variations between day and night. Based on the aforementioned information, the Departamento Geología Aplicada of the Servicio Nacional de Geología y Minería (SERNAGEOMIN) concluded that the increase in fumoralic activity during January and February in comparison to previous years at Planchón-Petero was due to phreatic water produced by the underground infiltration of melted snow. There was an increase in water in the area because there was a greater amount of snow accumulation during 2000 than in previous years. There appeared to be more steam emitted from Planchón-Peteroa's fumaroles than usual due to the reduction in atmospheric temperature at that time of the year and/or the greater ambient humidity causing the water vapor to condense. Although the increase in fumarolic activity was not determined to be of magmatic origin, SERNAGEOMIN noted that the abundance of water could trigger small phreatic explosions that could potentially emit ash and larger pyroclasts. In addition, water that originates from the zone of craters and travels via the Claro River could be contaminated. SERNAGEOMIN recommended that the Claro River should be monitored to determine if contamination occurs and that flights over the volcano should be conducted in order to photograph variations in fumarolic activity. SERNAGEOMIN plans to seismically monitor the E flank of the volcano in order to detect possible microseismicity. Information Contacts: José Antonio Naranjo, Jefe, Departamento Geología Aplicada, Servicio Nacional de Geología y Minería (SERNAGEOMIN), Avda. Santa Maria 0104, Casilla 1347, Santiago, Chile (URL: http://www.sernageomin.cl/). Explosive eruptions began at Planchón-Peteroa volcano in early September 2010, generating plumes reported to have reached altitudes of over 7 km. From the time of our last report on the volcano in March 2001 (BGVN 26:03) into 2010, we have learned of no significant eruptive activity as reported by Servicio Nacional de Geología y Minería (SERNAGEOMIN - the Chilean National Service of Geology and Mining). On several occasions during this ~9-year period, increased fumarolic activity was reported at Planchón-Peteroa. It was typically described as being normal and likely caused by atmospheric changes that made the plumes more visible from greater distances. This increased visible activity was also reported as being common when snow melts in the crater and more steam is produced. The volcano's previous reported eruption occurred in November 1998 (BGVN 24:03). Beginning 6 September 2010, the ice-covered volcano erupted in a series of small ash and gas clouds (table 2). SERNAGEOMIN reported that the eruptions were probably phreatomagmatic (caused by the interaction of water with magma at depth inside the volcano). During the day, black pyroclastic eruptions reached altitudes of up to 1.2 km above the crater area, and a plume extended ~30 km to the E and, to a limited extent, to the N and S. Pictures from Romeral (about 61 km NW of the volcano) showed emission of gases and gray ash that rose ~200 m. The same day at 0647, SERNAGEOMIN recorded an M 5.2 earthquake at 13.4 km depth, located ~15 km SE of the volcano. According to SERNAGEOMIN, an overflight on 7 September revealed that the 6 September explosions, during which pulses of gas and ash occurred every 40-60 seconds, were possibly phreato-magmatic in origin and similar to the explosions in 1991. Plumes rose 200 m above the crater and ash mostly fell within 10 km to the E.
Table 2. Ash and gas plumes from Planchón-Peteroa as reported by SERNAGEOMIN (abbreviated SERN in table) and Buenos Aires Volcanic Ash Advisory Center (VAAC) from January-October 2010. 04, 06, 07 Jan 2010 0.25 -- SERN Fumarolic plume only. 28 Jul 2010 -- E VAAC Gas plume only. 06 Sep 2010 0.2-1.2 10-30 km E, N, S SERN Phreatomagmatic explosions; pulses of gas and ash every 40-60 sec during the eruption. 10 Sep-13 Sep 2010 -- -- SERN With time, plumes rising from the vent had progressively less ash and higher concentrations of water vapor; juvenile material absent in ash petrographic and mineralogical studies. 18 Sep 2010 -- 22 km SE NASA Earth Observatory Eruption intensified; ash on snow under plume. 21 Sep 2010 6.1 SE VAAC Ash plume. 26 Sep 2010 4.3 SSE VAAC Ash plume. 30 Sep-03 Oct 2010 3-6.1 Multiple directions VAAC Strongest emission of the past 3 weeks. Ash plume diffused over wide area of Argentina. 06 Oct-12 Oct 2010 4-6.1 Multiple directions VAAC Ash plume. 12 Oct 2010 4.6 E VAAC Ash plume. During 16-30 September 2010, SERNAGEOMIN stated that monitoring data at Planchón suggested the presence of a magmatic body interacting with the volcano's surface hydrothermal system, resulting in smaller eruptions. During this period there were a total of 348 seismic events (attributed to rock fracture) and continuous tremor (attributed to the passage of fluids inside the volcano). The eruption and resulting plume intensified on 18 September. The volcano is on the border between Chile and Argentina, and satellite imagery showed that the majority of the ash dispersed SE into Argentina. NASA's Earth Observatory website featured a view of the snow-covered ash on 18 September 2010. Figure 6 shows a dark ash plume rising on 21 September 2010 from Peteroa, the active crater in the complex. An aqua-colored acid lake appears to the NE of Peteroa. Most of the surrounding high-altitude landscape is covered in snow, but fresh ash covered large areas of that snow. Valleys and N-facing (sun-warmed) slopes are snow free, revealing bare brown rocks. Figure 6. This natural-color satellite image of Peteroa crater was acquired on 21 September 2010 by the Advanced Land Imager (ALI) aboard the satellite Earth Observing-1 (EO-1). NASA Earth Observatory image and analysis by Robert Simmon, using ALI data from the NASA EO-1 team. Courtesy of NASA Earth Obseratory Natural Hazards web site. On 30 September, SERNAGEOMIN officials flew over the volcano and observed modest pyroclastic eruptions, emissions slightly stronger than those observed for during the previous 3 weeks. The eruptive activity remained constant from the SW crater, which discharged a relatively dense column of ash, gases, fumes, and water vapor. The emission of ash and gas was maintained from the bottom NE edge of the SW crater, but it was more continuous, dense, and vigorous than that observed during the overflight on 7 September 2010. The 30 September ash column emerged from the crater and attained a height ~400 m above the volcano, and spread to the E over a wide area in Argentina. During the 30 September overflight, observers noted a major part of ash plume distributed to the E and then bending to the NE, extending some tens of kilometers, with estimated plume-top altitudes of up to 6 km. A trace, more-dilute plume stretched to the S and SE to maximum altitudes of ~3 km. On the morning of 1 October 2010, warm, easterly winds (called Puelche-type winds) carried ash and sulfurous smells to the town of Los Queñes (~30 km NE of the volcano). During 6-12 October ash plumes rose to altitudes of 3-6.1 km and drifted in multiple directions. Observations from Romeral and photos sent by staff from a mining company (65 km WNW) showed that plume changed from gray to white on 13 October. The plume was smaller, with heights of less than 200 m above the crater. The Alert Level 4 was continued, before being lowered to Alert Level 3 on 27 October and then to Alert Level 2 on 11 November. The MODVOLC thermal alert system had not detected any thermal anomalies since at least 2000. Information Contacts: Servicio Nacional de Geología y Minería (SERNAGEOMIN); Buenos Aires Volcanic Ash Advisory Center (VAAC) (URL: http://www.smn.gov.ar/vaac/buenosaires/productos.php); NASA Earth Obseratory (URL: http://earthobservatory.nasa.gov/); MODIS/MODVOLC Hot Spot web site, Hawai'i Institute of Geophysics and Planetology (HIGP) Thermal Alerts System, School of Ocean and Earth Science and Technology (SOEST), University of Hawai'i, 2525 Correa Road, Honolulu, HI (URL: http://modis.higp.hawaii.edu/). Planchón-Peteroa is an elongated complex volcano along the Chile-Argentina border with several overlapping calderas. Activity began in the Pleistocene with construction of the basaltic-andesite to dacitic Volcán Azufre, followed by formation of basaltic and basaltic-andesite Volcán Planchón, 6 km to the north. About 11,500 years ago, much of Azufre and part of Planchón collapsed, forming the massive Río Teno debris avalanche, which traveled 95 km to reach Chile's Central Valley. Subsequently, Volcán Planchón II was formed. The youngest volcano, andesitic and basaltic-andesite Volcán Peteroa, consists of scattered vents between Azufre and Planchón. Peteroa has been active into historical time and contains a small steaming crater lake. Historical eruptions from the complex have been dominantly explosive, although lava flows were erupted in 1837 and 1937. Naranjo J A, Haller M J, 2002. Erupciones holocenas principalmente explosivas del volcan Planchon, Andes del sur (35° 15' S). Rev Geol Chile, 29: 93-113. Tormey D R, Frey F A, Lopez Escobar L, 1989. Geologic history of the active Azufre-Planchon-Peteroa volcanic center (35° 15' S, southern Andes), with implications for the development of compositional gaps. Asoc Geol Argentina Rev, 44: 420-430. There is no Deformation History data available for Planchón-Peteroa. Planchón-Peteroa is a complex volcano with several overlapping calderas. Activity began during the Pleistocene with construction of Volcán Azufre, followed by formation of Volcán Planchón, 6 km to the north. The youngest volcano, Volcán Peteroa, consisting of scattered vents between Azufre and Planchón, has been active into historical time and contains a small steaming crater lake. Historical eruptions have been dominantly explosive, although lava flows were erupted in 1837 and 1937.
óAn explosive eruption lasting three weeks began on February 9, 1991 from a 200-m-wide crater between Planchon and Peteroa. This photo shows an ash plume rising from the crater on February 11. Ashfall occurred as far as 70 km from the crater. Fish in the Claro and Teno rivers were killed and water supplies were contaminated by tephra and water ejected from the crater lake. Photo by Moyra Gardeweg, 1991 (Servicio Nacional de Geología y Minería, Chile). An aerial view from the NW overlooks Planchón-Peteroa, a complex volcano with several overlapping calderas. In the left foreground is the caldera wall of Planchón volcano. The crater complex of Peteroa is in the center, and Volcán Azufre lies at the upper right. Activity began in the Pleistocene at Volcán Azufre, followed by formation of Volcán Planchón, 6 km to the north. Volcán Peteroa has been active into historical time and contains a small steaming crater lake. There are no samples for Planchón-Peteroa in the Smithsonian's NMNH Department of Mineral Sciences Rock and Ore collection. Large Eruptions of Planchón-Peteroa Information about large Quaternary eruptions (VEI >= 4) is cataloged in the Large Magnitude Explosive Volcanic Eruptions (LaMEVE) database of the Volcano Global Risk Identification and Analysis Project (VOGRIPA).